Nvidia pushes out a feature-rich OTA update for the Shield in April, and unveils a new $3,000 super GPU. Nvidia is dropping plenty of news today on both the mobile and desktop GPU fronts, from $3,000 graphics cards to Shield software updates. Starting in the wonderful realm of the desktop GPU, Nvidia is bringing a new version of it's super-duper-ludicrous-speed-high-end GPU to market. 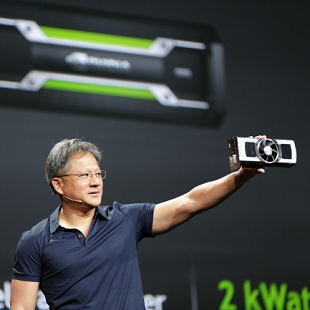 The Kepler-based, dual-GPU Titan Z packs 12 GB of memory and 5,760 cores. In other words: The Titan Z is two Titan Black GPUs on one PCB. Nvidia says the Z is for those looking for 5K and multi-monitor gaming bliss. The Titan Z is coming shortly ahead of an expected dual-GPU card reveal from AMD -- the R9 295X (my working title, not AMD's). My guess is AMD's offering won't be $3,000, but it also won't be as powerful, assuming it's based on two R9 290X GPUs. Shifting gears to the Nvidia Shield, the Tegra-powered gaming portable will be getting a feature-rich OTA update on April 2nd. The update will upgrade Android on the Shield to 4.4.2 (KitKat), first and foremost, but plenty of Nvidia-specific updates are in tow. GameStream is getting a major update, and the service will now allow for PC-to-Shield gaming outside of the PC's network. Want to play Borderlands 2 on you Shield while your surviving another trip to the in-laws house? That's totally possible now. The Shield will be able to wake up a sleeping PC remotely, and connecting to password-protected machines will be possible as well. You'll need a "robust" WiFi connection (5 Mbps or better) to use the Remote GameStream feature, but you're no longer chained to your home network. Streaming will now be possible from Nvidia-equipped notebooks, too. If your gaming laptop has a GTX 600, GTX 700, or GTX 800 GPU, you're likely in the clear ("likely" because some lower GTX 600 GPUs might not cut the mustard). Other enhancements include Bluetooth keyboard and mouse support, a revamped TegraZone app, and upgrades to the Gamepad Mapper tool. Last but not least: From right now through the end of April, the Shield will see a price drop from $249 to $199. That's a standalone price -- no GeForce GPU purchase required.